Home Store Spotlight Find The Perfect Fit Online… Just Got Easier With Kiyonna! Besides showcasing plus size fashions, styles and brands that we love, our aim is to guide you toward those online stores and designers that have YOU in mind as a shopper when they create their fashions, as well as setup their online shopping experience for us. So today we’re showcasing some of the different things Kiyonna offers and make available for us to use on their website, which makes it that much easier to shop and find the perfect fit! In an online world, it’s hard finding that perfect piece of clothing. Will it fit? Will it work for my body? So many questions and a lot of the time you have to take chances. Especially in the plus-size community. There just aren’t a lot of in-store options and sometimes online is the way to go. The good news is that Kiyonna is doing everything they can to make sure your shopping experience is as easy as possible! Years ago, they were at the forefront of showcasing “real” women in their clothes. These beautiful ladies are customers like you and me, that felt amazing. They help make sure others could see what a certain style and size would look like on. You can find these women under the ‘Style Spotlight‘ on a Kiyonna product page and the website’s homepage. Did you know that Kiyonna’s even gone further in helping you find that perfect fit? They have recently unveiled a new tool that you have to see! When viewing a style, you will find a ‘Find Your Fit‘ button underneath the size options. 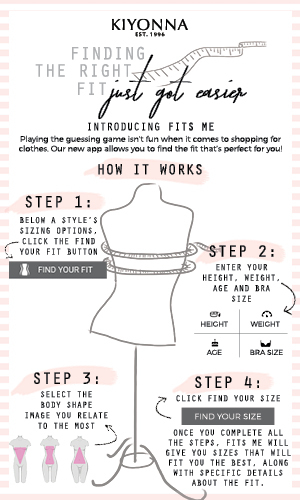 This will give you a pop-up where you can enter in your height, weight, bra size, and other information to find your unique fit. Trust me, you will want to try this out. This tool will break down the size options best for you and tell you how it will fit on your body. This is the closest you will get to trying something on online. See what’s new and check out the tool! Of course, technology can get things wrong and sometimes the style just isn’t for you. Not to worry though, Kiyonna has that covered too. They have a generous 30-day return policy and an awesome exchange process. There you have it! Some of the best options to finding amazing plus-size style and the best fit in one place. Try it out yourself, spread the word, and look fabulous!